This article is about the microgame in WarioWare: Twisted!. For the object, see Baseball (object). Baseball is one of 9-Volt's microgames in WarioWare: Twisted!. It is set in the NES game of the same name. The object is to prevent the batter from hitting the ball. 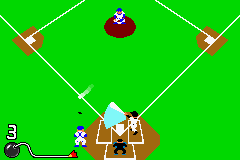 Level 1: The batter's bat is small. Level 2: The batter's bat is bigger. Level 3: The batter's bat is huge. This page was last edited on November 12, 2018, at 23:40.